E. Matthew Heinrich, MD, performs a direct anterior approach total hip arthroplasty (THA) on the right hip of a 51-year-old male patient with rheumatoid arthritis who has been experiencing hip pain for 5 years. 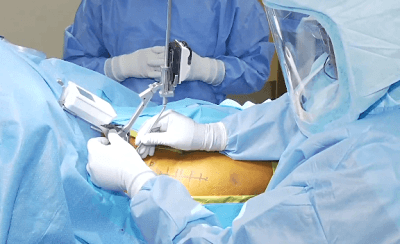 The procedure was broadcast live to attendees at ICJR’s 7th Annual Direct Anterior Approach Hip Course from Dr. Heinrich’s OR at Muve Health in Lakeway, Texas. Michael J. Taunton, MD, from Mayo Clinic in Rochester, Minnesota, moderated the surgery and relayed questions from attendees to Dr. Heinrich. Dr. Heinrich is using a special table for the procedure. He has done direct anterior approach THA with a standard OR table and with this specialized table and he says he prefers the special table because it provides good consistency for patient positioning. Click the image above to watch Dr. Heinrich perform the procedure. Dr. Heinrich has disclosed that he receives royalties from DJO Surgical, DePuy Synthes, and Zimmer Biomet; that he provides medical education for DJO Surgical, DePuy Synthes, Medronic, and OrthAlign; and that he has an ownership stake in Hyde Park Surgery Center and Muve Lakeway. Dr. Taunton has disclosed that he receives research report from Stryker and Zimmer Biomet and that he receives royalties from and is a paid consultant for DJO Global.